Mentor Works helps businesses across Canada develop and implement Canadian government funding plans. We work with clients across a wide range of industries and regions to tailor a selection of business grants and loans that accelerates your business’ growth. Since 2008, our team has helped Canada’s most prominent and fastest growing organizations execute a dynamic and proactive funding strategy. By working with Mentor Works, you’ll simplify the entire funding process, from research to writing, submission, and reporting. Browse our testimonials to hear what business leaders have been said about their funding process, or view our client spotlight blogs to discover how they’ve executed a government funding plan. Not be an exclusive retailer or distributor. 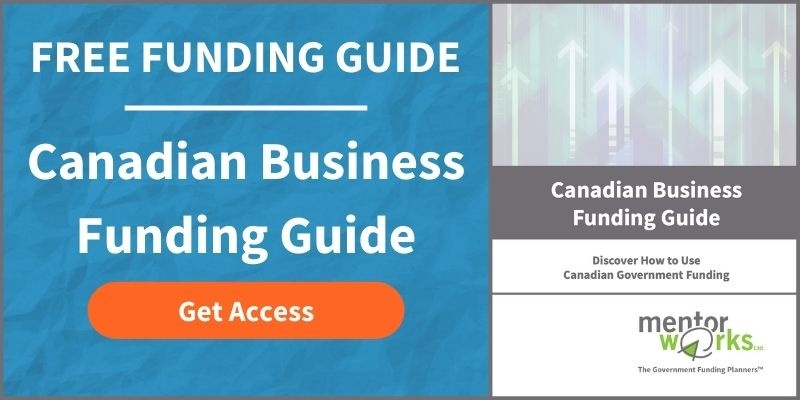 These are general eligibility factors and businesses should consult specific Canadian government funding programs for specific eligibility criteria. To discuss your eligibility for business funding programs, please contact Mentor Works. Most Canadian and Ontario government grants and loans are only applicable to businesses that have been incorporated for at least three years. However, this is not to say that startups and entrepreneurs do not have other opportunities to receive funding and business expansion support. Several resources are available to help startups with incorporating and growing their business to a maturity where traditional small business grants and loans can be accessed. To discover the steps your early-stage business can take to expand its funding eligibility, please download our free Startup Funding Checklist. Our website serves as a comprehensive resource for loans and grants for small business’ strategic initiatives. Whether you are looking for a specific funding program, questions on the process, or would like to partner with us to help your clients obtain funding, we always appreciate when our readers contact us. We also provide regular funding updates through the weekly Canadian Government Funding Snapshot™ e-newsletter and through our Twitter, LinkedIn, and Facebook social media channels.